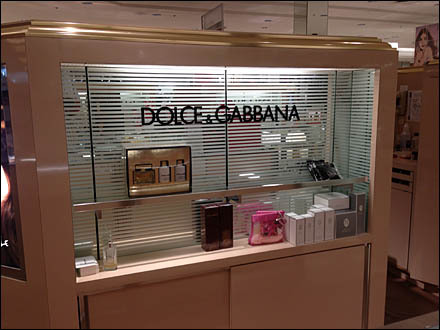 What first caught my attention was the expansion of Dolce and Gabbana from store and brand into a full fragrance station within an unscale store’s women’s cosmetics department. While taking in the details I noted the Venetian Blind backdrop to the Dolce & Gabbana® masthead. Normally I try to avoid “sight leaks” … the pass through of an eye to points beyond the desired focal plane. But this intrigued, obscuring just enough see-through to keep my eye in the foreground, while hinting at what lay beyond, and expanding the sense of space. I wonder what canb be done visually id the blinds are opened, or retracted completely? CLICK the gallery to step through various focal distances. “Dolce & Gabbana Index Page” for all resources.